The students got updates at the expo about the policy of admission of 16 universities in Australia, Malaysia and United Kingdom. Australian High Commissioner Peter Heyward and AEO Chief Executive Officer Saad Mehmood guided the students who were informed about the education in Australia at the expo. Helen Nuttall arranged the desk for the representation of the La Trobe University of Melbourne. She said the feedback and response of the students and the visitors was so inspiring. She added that majority of students were willing to get the information about the expenditures for living, fee system and the scholarships. Australian High Commissioner Peter Heyward expressed his contentment by saying that it was a pleasure that the AEO Education Expo is performing efficiently and they are providing a stage for awaited students where they can get information about their study plans and best suitable options in Australia. He added that Australia has a good reputation because of its educational institutes that’s the reason that a huge number of international students have chosen Australia for their higher education studies. 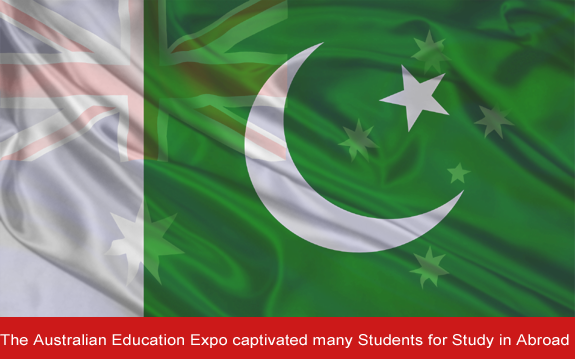 Talking about the AOE Australian Education Expo, Muhammad Nadir, student of University of Engineering and Technology Taxila, said that he attended the Expo to get information about the programmes options at leading universities of Australia. Another student Ahmad Ali who completed his bachelors of engineering from the National University of Science and Technology (NUST) said that his batch fellows informed him about the standard of education in the universities of Australia, so he was looking forward to study there. Saad Mehmood, the AOE Chief Executive Officer and Resident Director said that more than 300 students were there in the event, seeking information about the opportunities and best options for higher study in abroad.